Product Lifecycle Management (PLM) software can help your company keep up with the increasing complexity of developing today’s high-tech products. While smaller companies may use relatively simple Product Data Management (PDM) tools, larger companies rely on full-featured PLM systems that help automate processes and share data across global supply chains. Mid-size companies can feel stuck because PDM is too basic, but PLM feels out of reach. Midsize manufacturers need a system that quickly delivers the core capabilities they need to streamline product development but also gives them room to grow value over time. 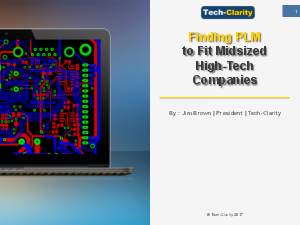 So, what’s the right size PLM to fit a midsized high-tech company? Download this resource and take a look.